WHAT IS XERO ALL ABOUT? Xero is a cloud-based accounting software that is transforming the way businesses are managing their finances. Xero gives you a real-time view of your cashflow, and the power to stay up-to-date with your financial status. 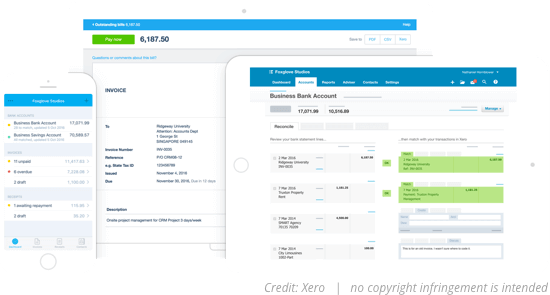 Xero includes the host of features that will streamline the way of your business’s finances are managed. You can include providing online invoicing with online payment options. You are able to keep track of your financial status with a customizable dashboard, and even track your employees’ payroll information with simple payroll roll. Xero also seamlessly integrates with the number of other leading systems to solve your business needs. For a full list of who Xero integrates with go here. business up and running on Xero. HOW CAN WE HELP YOU GET MOST OUT OF XERO? If you need to push / pull information to Xero from an another system, we can help. Create, customise and manage dashboards to track your business’ financial status.